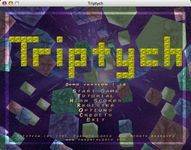 Triptych is a fast-paced physics based block dropping game that will keep you coming back for more. Maneuver and rotate blocks as they fall so that 3 or more of a color are adjacent to each other. By achieving this, the blocks will be destroyed and the player will collect points. As blocks are destroyed, connected blocks are freed to move independently and blocks above will fall to fill the empty spaces. Unlike other puzzle games, the game board is a living entity where the blocks obey the laws of physics. Every game is a unique experience!